XFA is short for XML Forms Architecture, a family of proprietary XML specifications. XFA's main extension to XML are computationally active tags. When you remove XFA tag from PDF form, interactive PDF form will turn to normal PDF file. In addition, all instances created from a given XFA form template keep the specification of data capture, rendering, and manipulation rules from the original. 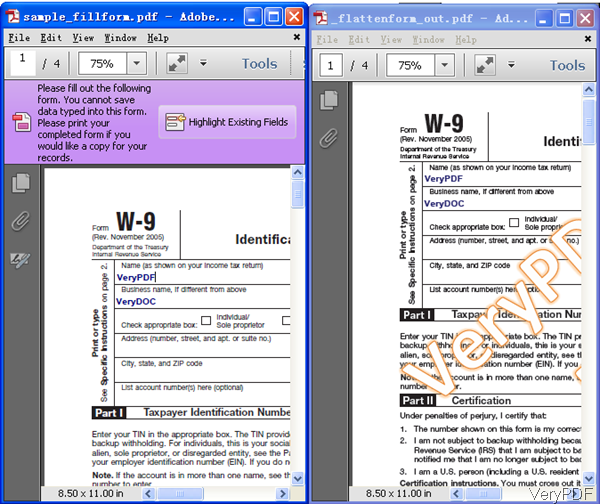 In the following part, I will show you how to change PDF form to normal PDF by removing XFA tag. 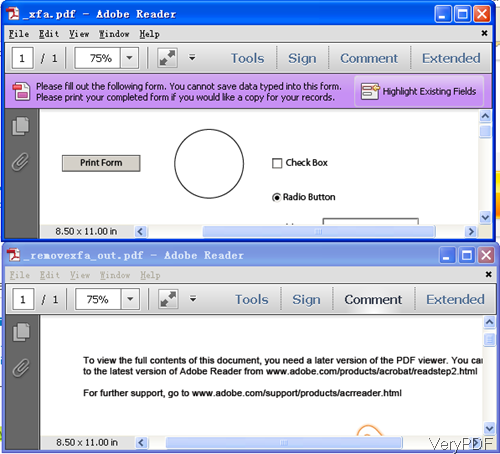 VeryPDF PDF Toolbox can be used to merge, split, encrypt, fill PDF form, edit PDF description information, and optimize PDF. If you need to know more about it, please visit its homepage. This software can work under multi platforms: Mac, Linux and Windows. When downloading, please download the right version according to your computer system. When you need to remove XFA tag from PDF file, please refer to the following command line template. -removexfa :this parameter can be used to remove /XFA tag from PDF file. Please make sure the input file is interactive PDF form. When you process conversion, please call this software, input the full path of input PDF form, specify output PDF file path and then add parameter –removexfa. Please check effect from the following snapshot. PDF with XFA information and without are totally different. When you need to change PDF form to normal PDF file, there is another method by PDF Toolbox. -flattenform : this parameter can be used to convert fillable PDF forms to static PDF file. Please check working effect from the following snapshot. Note:even if both of the above command line templates can be used to change PDF Form to normal PDF file, but please use those parameters under different situations. Say when you need to process static forms, parameter –removexfa will be totally useless to this kind of PDF form. When handling PDF from with XFA information, that is dynamic pdf forms, parameter –removexfa can works normally. When you use this software, please do not be confused about them or else the process may fail. When you process, maybe you can judge them first then choose the proper parameter. When processing static PDF form, please use parameter –flattenform. There are too many parameters to be detailed here. During the using, if you have any question, please contact us as soon as possible. This entry was posted in PDF Toolbox Command Line and tagged remove XFA tag. Bookmark the permalink.